As a pediatric speech-language pathologist and Clinical Instructor, I'm always on the hunt for new resources that provide high-quality, accessible information about speech and language therapy. I recently found a new such resource: SpeechScience. The SLPeeps over at SpeechScience are striving to create a website that is full of "accessible, evidence-based information intended to be available to everyone: Clinicians, educators, parents, and anyone else with the need to learn more about communication sciences and disorders." If you've been following my blog for any length of time, you'll immediately recognize that this jives really well with the goal of ChildTalk: to provide high-quality information about speech and language in a readable way. Good stuff! I like SpeechScience's mission so much that I'll be contributing blog posts about pediatric speech & language and family-centered care. You can find my first blog post there right now. It's all about the use of recasts with toddlers and preschoolers - when to use recasts, for what purpose, how often, and with whom. You can access it here: The Use of Recasts with Toddlers and Preschoolers. Happy Reading! I’m a huge fan of using simple activities for working on speech and language. Simple, because I’m a working mom with lots on her plate who just doesn’t have time for planning for and buying materials for more complex crafts and activities - either at home or at work. And activities, because speech and language are best promoted inside activities that are meaningful and motivating to children! I recently came across an interesting simple activity on Pinterest: Hidden Colors. Thanks to Busy Toddler for this idea! Hidden Colors is super simple because it contains exactly three ingredients: baking soda, vinegar and food coloring. Easy peasy! I've since used this activity to entertain my own daughter and to work on building speech and language during my speech-language sessions with preschoolers. Hidden Colors involves a slight twist on the classic baking soda and vinegar volcanoes. Instead of building a volcano and making it explode, baking soda is sprinkled into the cups of a muffin tin. Before sprinkling the baking soda into the cups, though, drops of food coloring are hidden underneath the baking soda. Then, when your kiddo pours vinegar into the cup, it not only fizzes and foams (which is fun in and of itself), but a color is revealed. Super simple, as promised, and super fun! The key to success with this activity lies in making sure you don’t use very much baking soda in the cup of the muffin tin. The first time my daughter and I tried this, I dumped way too much baking soda in the cup and it really didn’t do much except for fizz - no color at all. The second time around, I put 3-4 drops of food coloring in each muffin tin and poured in just enough baking soda to cover the food coloring. Lots of color this time around! 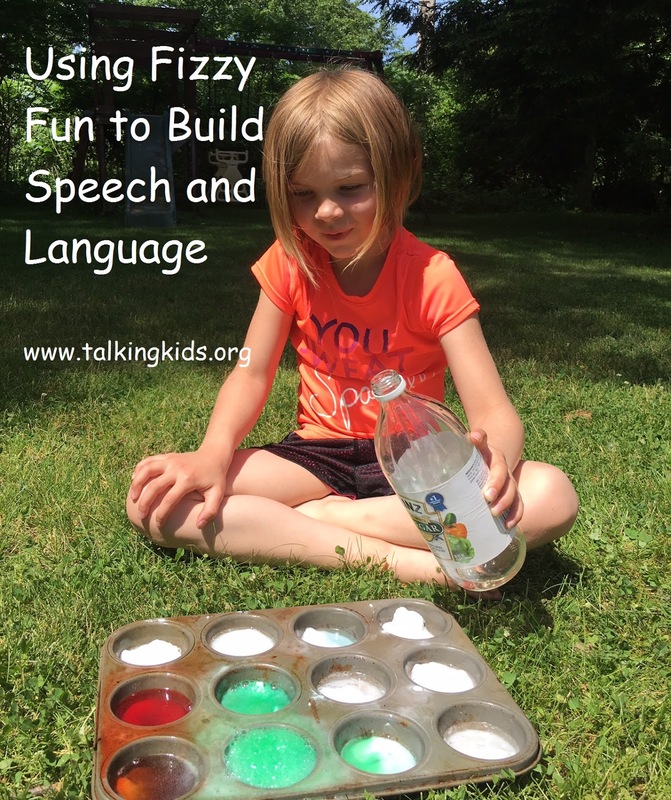 So how would you use this activity for promoting speech and language? In lots of ways! If you have a toddler who is just starting to talk, you can build his vocabulary by using parallel talk and self talk to describe your actions using simple verbs, nouns and concept words: pour, in, bubble, wet, more, wow! Repeat these words over and over as you do the actions. You can also use expansion to extend your toddler's words into short phrases; if he says, “bubbles,” you can say “red bubbles!” or “blue bubbles” “more bubbles” and “the bubbles are gone! This type of indirect language facilitation is known to be very effective in helping grow a child’s language. You can also set up communication temptations by pouring the vinegar into one of the cups, ooohing and ahhhing as it fizzes and foams. Then, when the action is done, put the cap on the vinegar and just wait! When your child does something to indicate he/she wants more, you can ask her to say “bubble” or “more” or “pour” if she will imitate your words, or help her use sign language if she’ll let you help her sign. If you have 2-3 year old who is using short, but grammatically incorrect utterances, you can use recasts to fill in the gap of her words. For example, if she says “bubble blue,” you can say, “The bubbles are blue!” Research has found that using recasts can be a powerful ways to help children to build their grammar (or syntax) skills. Children really start to learn their colors during the 2-4 year old age range, too, so you can ask your child to tell you what colors emerged from the cup. If she struggles, you can use forced choice (are the bubbles blue or are they red?) or just go back to using parallel talk and self talk to surround him/her with the language to help her learn colors. The more she hears you say the names of colors, the more likely she will be to say those colors! If you have a 3-5 year old, you can work on building more complex language. Around this time in development, children start using conjunctions such as “and” and “if” in their sentences. You can use these conjunctions to make longer sentences that describe what you’re doing. For example, “Let’s pour the vinegar in and see what color we find!” During this age range, children also begin to master past tense verbs, so you can use this verb tense frequently (“I poured the vinegar!” “The bubbles turned blue!”). During the preschool years, you can also also start working the mental state verbs (think, know, remember, hope) that go along with theory of mind. For example, before pouring the vinegar into the baking soda, you can each predict the color that will emerge, using the word “think” (“I think it’s going to be blue!”). Then, after the fizzing has ended, talk about what you thought and how it compared to reality (“I thought it would be blue, but it turned red!”). As an additional bonus, this type of sentence also has the conjunctions I just described above! You can also take pictures of each step of the activity; review them with your kiddo and describe what happened in each step. Later, have him tell the story to someone else who didn't watch the activity. All of this helps children begin to separate their thoughts from both the actual events and the thoughts of others; it also gives them practice using language to talk about things that have already happened - something that becomes really important during the preschool and early elementary years. One easy activity, three simple ingredients, and endless speech and language possibilities! One important strategy for helping infants eventually learn the power of words is called contingent vocal imitation, which is a fancy title for a really simple concept. This strategy is all about what parents do in response to their infants’ vocalizations. In other words, when a child coos (makes those sweet, soft vowel sounds), babbles (“bababa” or “badagaba”), or makes any noise at all, what do parents do in response to these sounds? It turns out that if parents imitate their baby’s sounds, their baby will then make more sounds. Specifically, their baby is likely to vocalize more often (Pelaez, M., Virues-Ortega, J., & Gewirtz, J., 2011; Dunst, Gorman & Hamly, 2010). This is important because when a baby vocalizes more frequently, people respond more. When people respond more…. 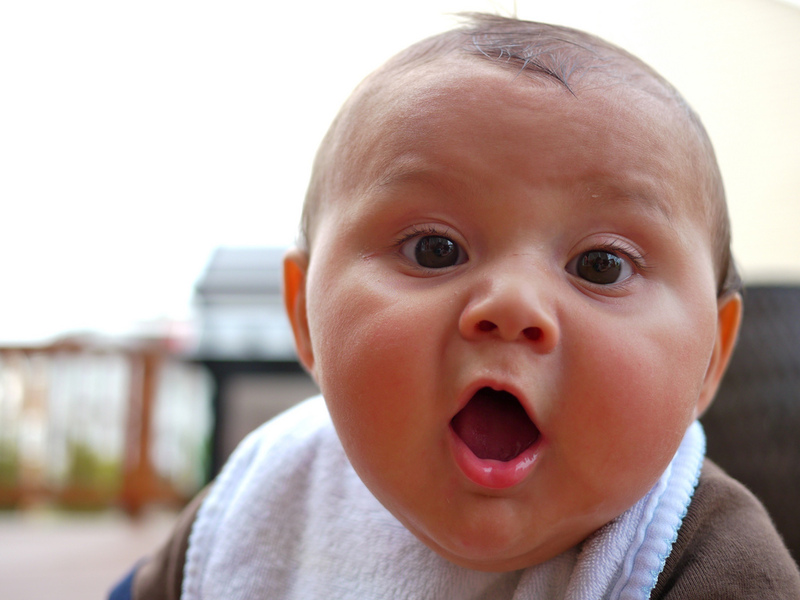 (you guessed it)...babies vocalize more! In the process, infants learn that their vocalizations have a huge impact on the world around them. They come to understand that they can use sounds to communicate with others. And, boom, language emerges. Imitation of your baby’s sounds isn’t the only option for responding to his vocalizations, though. You can also respond by simply acknowledging that he made a noise (“mmm hmmm”), by labeling what he sees (“a dog!”), by commenting on some aspect of what he is looking at (“it’s so pretty!”) or by explaining what he wants (“you want your blanket!”). Researchers have found that a mom’s “sensitive” responses to her infant’s vocalizations are related to increases in infant vocalizations at 8-14 months of age and to an increased use of words and gestures at 15 months (Gros-Louis, West, & King, 2014). “Sensitive” is defined as acknowledging an infant vocalization in a way that is directly connected to whatever the infant was seeing or doing when he made a sound. It’s contrasted with a “redirective” approach in which mothers essentially change the topic by directing their infant to look at or pay attention to something else. So, the bottom line is this: Listen to your infant! When she vocalizes, respond! If she’s on the younger side (0-6 months), imitate her sounds - she might just imitate right back. Even if she doesn’t, she’s likely to vocalize more across time - which gives you more opportunity to respond and gives her increased opportunities to understand that her sounds have an impact on her world. If she’s older (6-12 months or so), you can still imitate her sounds, but you might also pay close attention to what she’s looking at and respond to that (“Oh, a puppy!” or “It’s so pretty!’ or “You want your bottle?”). The key is in responding to your infant, rather than directing her to look at things or requiring her to make sounds upon your command. Instead: Wait. Watch. Listen. Respond. If this all this sounds familiar, it’s because I’ve written about similar concepts before, as it relates to using self talk and parallel talk with toddlers. And if you think you’re already doing this, you probably are! Much of the time, these strategies come pretty naturally to parents. Now, though, you know why it’s such a powerful thing to do. Happy babbling! Dunst, C. J., Gorman, E., Hamby, D. W. (2010). Effects of adult verbal and vocal contingent responsiveness on increases in infant vocalizations. CELL Reviews, 3, 1-11. A while back, I posted on the ABCs of ABA. Within that post, I described the basics of ABA, a method of therapy that I believe is often a bit misunderstood. I also promised to follow that post with a more thorough description of the shades of grey that exist within the broader field of ABA. Before I do that, though, I want to touch on the effectiveness of an approach that often seems to be the very opposite of ABA: indirect language stimulation. And before I do that (hang with me here), I'm going to briefly explain the idea of a continuum of naturalness that exists within the field of speech-language therapy. This term was first coined by Fey in 1986, and I think it is a wonderful way to help us wrap our minds around the variables that exist when we think about the various methods of therapy. The ends of this continuum represent the relative naturalness of a treatment context. On one end of the continuum, we have indirect language stimulation approaches. These are highly natural, often embedded within the child's daily routine, tend to be unstructured, and are built on the idea of being responsive to the child. On the other end of the continuum, we have highly structured ABA approaches, which tend to be highly decontextualized (*not* in the context of daily activities and play), very structured, and highly adult-directed. In this post, I'm going to cover the left hand side of this continuum: indirect language stimulation. In a nutshell, this approach to language intervention involves describing what a little one is seeing, doing, and feeling. I've described different techniques within this broader method before, in various posts such as All Kinds of Talk, Self Talk & Parallel Talk, and Expansion and Extension. As you use these techniques, you are providing models of language that are a match for the child's language level. So, if a baby mainly points and vocalizes, you use one and two word phrases; if toddler uses one and two word phrases, you use three and four; if a preschooler uses short sentences without grammar, you respond with longer sentences with appropriate grammar (you get the idea, right?). It pretty much looks like nothing is happening, right? Just a mom and her child having a snack. This is what it should look like! It's natural- that's why it's on the far left hand side of the continuum of naturalness. But there is more going on than meets the eye. Notice how the language is simple, and related to the activity at hand. Also notice mom's responsiveness - language models are provided in response to the child's utterances (Child: "Please?" Mom: "You want apple." "Apple please!"). And when the little one tries to get mom's attention by saying 'mmm,' again, mom responds with another "mmmm." They go back and forth a few times - this is turn-taking, and within it lies the beginnings of conversation. Eventually, mom uses a language model directly related to the "mmmm": "Yummy apple." One more example. This activity is a little more structured, but the approach used is the same. Notice how mom's language is in response to the child's language (Child: "Ride..." Adult: "You're riding the bike!") and take note of the fact what mom says is just slightly longer than the toddler's language. And, as an additional bonus, observe how the child's language changes- from one word sentences at the beginning, to a two-word phrase at the end of the clip. Indirect language stimulation doesn't always work immediately in the moment like this...but it's pretty cool when it does! Despite the fact that indirect language facilitation looks quite simple, research shows that it can be very effective. As I described in All Kinds of Talk, research indicates that the more parents use conversational talk with their typically developing child, the larger that child's vocabulary will be. When parents are responsive in their conversational interactions with their child, their child's language grows. Indirect language stimulation approaches have been shown to be effective for late talkers, too. In their article, Evidence-Based Language Intervention Approaches for Young Talkers, Finestack and Fey (2013) summarize the evidence in support of both general language stimulation and focused language stimulation. General language stimulation involves the techniques I just described in, well, a very general way. This means that there are no specific language targets (say, increasing verbs, or increasing nouns, or getting a child to use a specific type of two-word phrase). Instead, the goal is broad in nature: increase overall language skills. Finestack and Fey describe a randomized controlled trial (in other words, a well designed, scientific study) of a 12 week program that used general language stimulation (Robertson & Ellis Weismer, in Finestack and Fey, 2013). The researchers compared late-talking children who received genera language stimulation to late-talkers who received no intervention and found that, compared to the children who received no intervention, children who received the intervention made more gains in vocabulary, intelligibility, and socialization. Importantly, the parents of the children who received intervention felt less stress. And who doesn't want less stress in their life?! Focused language stimulation is very similar to the general language stimulation except that it's (you guessed it...) focused. 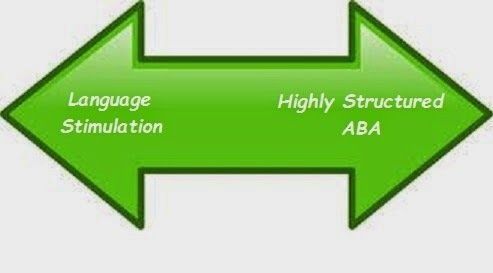 The language models that are provided by adults are chosen specifically for that child. So, an adult might model mainly verbs if these are lacking in a child's language. Or, the adult might model specific nouns. Or, the adult might model a specific type of early grammar marker, such as -ing (one of the earliest ways that children start marking verbs). This type of language stimulation, too, has been shown to be effective. Girolametto, et al, 1996 (in Finestack and Fey, 2013), taught parents to use focused language stimulation with their children. They compared the gains made the children of these parents to the gains made by children whose parents were not trained in use of these methods (don't worry - the non-trained parents got trained at the end of the study, too!). By the end of the study, the children whose parents were trained in focused language stimulation had significantly larger and more diverse vocabularies, used more multi-word phrases, and had better phonology (speech sound production). It's important to note that general and focused language stimulation have the most supportive research when used with late-talkers who don't have any other delays. The research is mixed when it comes to the efficacy of these methods with children with more significant delays and disorders, such as those with autism or cognitive disorders. Because of this, having other tools in our toolbox is very important. This is where the rest of the continuum of naturalness becomes important - and where my passion for contextualized ABA approaches begins. But, that's a post for another day. For today, we'll stop here, secure in the knowledge that when we surround our typically developing children and late-talkers in language models, their language grows. Fey, M. (1986). Language intervention with young children. Sand Diego, CA: College-Hill Press. Finestack, L. and Fey, M. (2013). Evidence-Based Language Intervention Approaches for Young Talkers. In Rescorla & Dale, Eds. (2013). 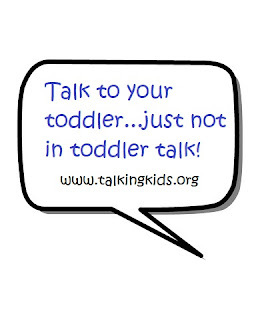 Late Talkers: Language Development, Interventions, and Outcomes. 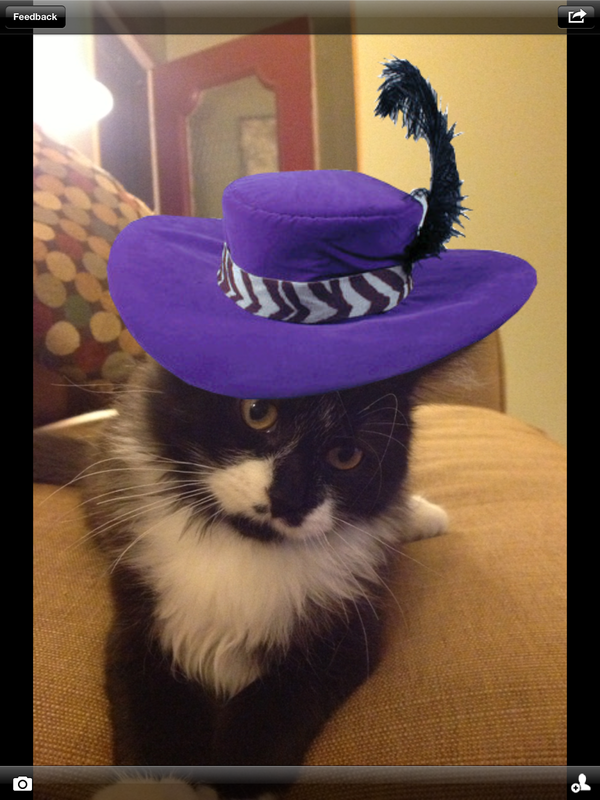 I found a new app I love! It's only $0.99, it's easy to use, and it's fantastic for targeting final 't' and simple language. Why this app? The concept is super simple: you take a picture of a kiddo, bring that picture into the app, and then put a variety of silly hats on! 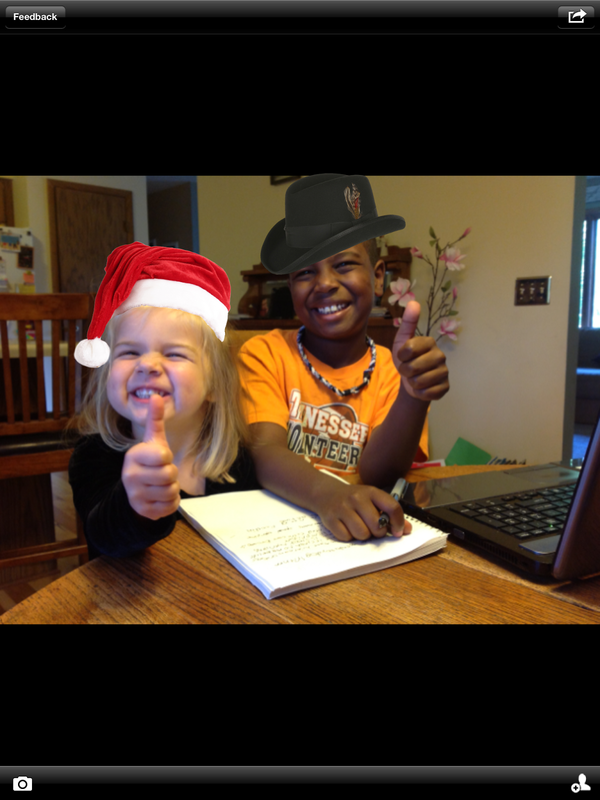 Kids love selecting the hats and then laughing at pictures of themselves in a variety of hats. There are a bunch of hats to choose from and you can make the hats bigger, rotate them, make them smaller, stack them, or make them disappear. This makes it super easy to work with kids who have difficulty producing final "t," ('t' at the end of words) because you can use the word "hat" over and over as you get new hats and play with them on the picture. This makes the focused auditory input (surrounding a child with a target sound) easy, meaningful, and productive. You can work on other final 't' words, too - pick white hats, or take a picture of a cat and have fun putting the hats on the cat! (Not that I did this. And I certainly didn't do this at home alone, just for the sake of amusing myself). Because you need to navigate to a new screen each time you want to get a new hat, you can easily set the app up to be a communication temptation, requiring the child to actually say "hat" prior to getting a new one. This lets you get lots of production practice with this one app. Note: I didn't receive a free copy of this app, nor was I paid for the post. In fact, I don't even know who makes this app! I just like it a whole bunch. 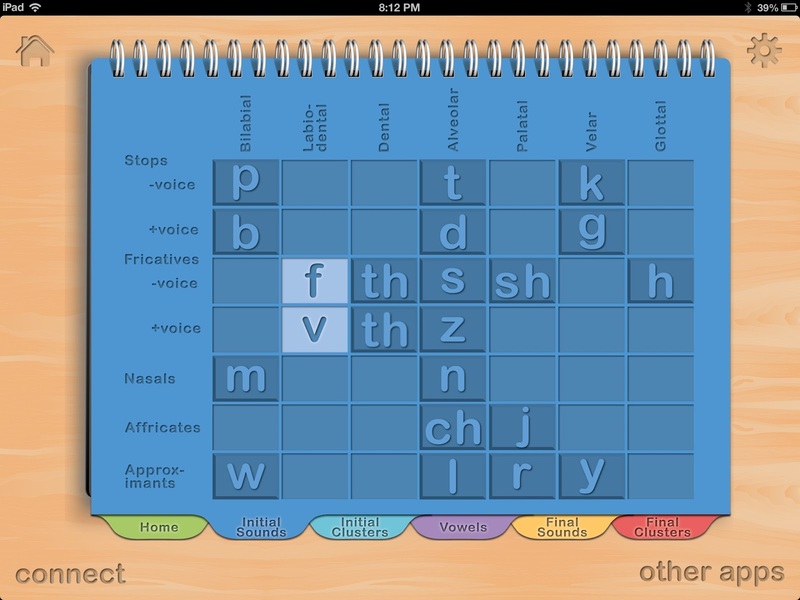 When I heard about Tactus Therapy's new App, Speech FlipBook, I was immediately intrigued. 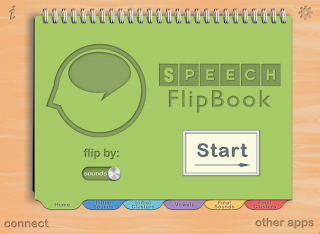 As a pediatric therapist, I am always on the lookout for new tools that will allow me to be a more efficient therapist, and I suspected that the Speech FlipBook would be one of those tools. And it turns out, I was right! As Tactus Therapy clearly states in their introduction to Speech FlipBook, this app isn't a therapy program; in other words, it's not designed to be given to a child to use independently. It doesn't have fancy graphics, songs, or games. But what it does have is so much more. 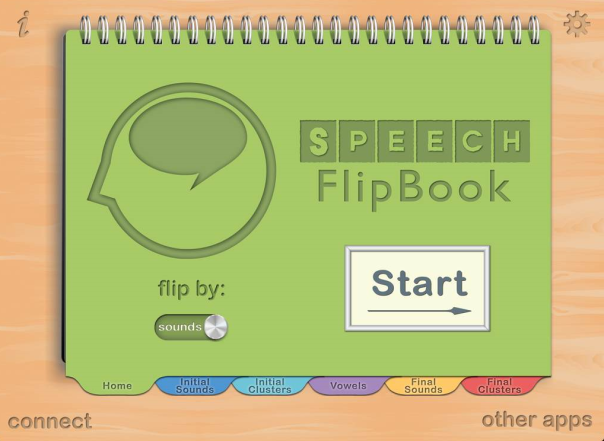 Speech FlipBook is wonderfully versatile tool for systematically creating sound and word lists to be used to address speech sound disorders such as apraxia and dysarthria. It's also a great tool for developing phonological awareness skills. 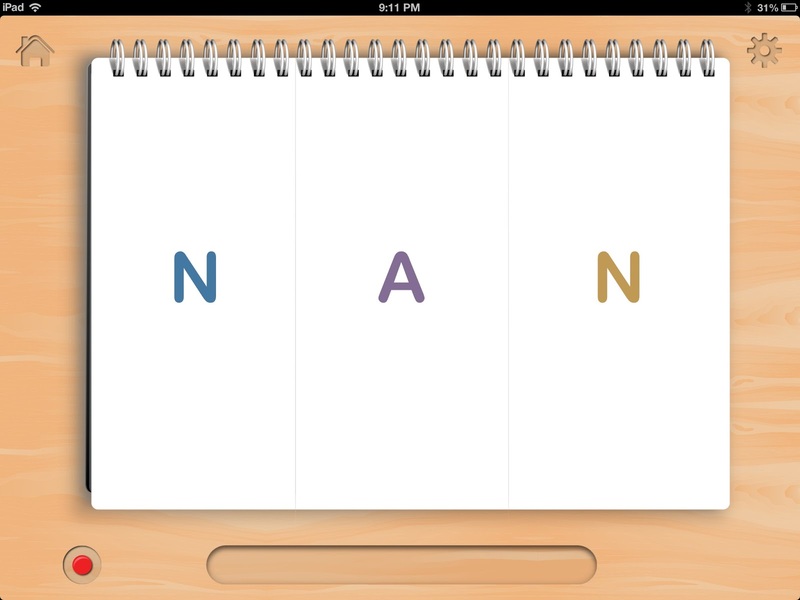 By far, the best thing about Speech FlipBook is the flexible, thorough nature of the app. 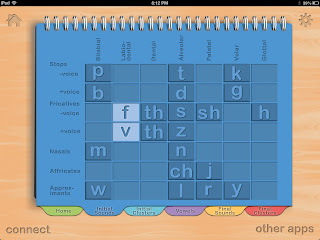 Using the settings carefully designed by Tactus Therapy, you can use this app to create words lists with any type of given criteria. Want words that just begin with bilabial (lip) sounds? Okay! Want words that only have "oo" and "ee" vowels? You got it! Words that have bilabial (lip) sounds in the initial (beginning) position of a word, "oo" and "ee" vowels in the middle, and tongue tip alveolar sounds (t, d, n) in the final position of a words? Sure thing. Want real words? Okay! Want non-words? You bet. Truly, I am amazed by how much thought must have gone into creating this app to make it so easy to generate word lists given highly specific criteria. Once you've created the word lists that fit your specifications, you can quickly flip through those words lists during intervention sessions. I love, love, LOVE the fact that you can flip either the whole word (moon, beat, boot) OR flip one sound at a time. Say, for example, you had a child who was working on producing /t/ final words. 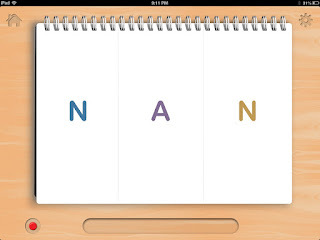 You could set the app to generate words that end only in "t." Then, you could choose to just flip through the different beginning phonemes but leave the vowel and "t" the same (wheat, neat, heat, feet, seat, cheat, meet), or you could choose to leave the initial and final consonant the same and just flip the vowel (meet, mat, mutt, met, mitt). OR you could choose to change the initial consonant and the vowel, but leave the final /t/ in place. Fabulous flexibility. Then, I pick words that transition from one place to another in place of articulation, but only stick to one movement pattern - say, bilabial (m, p, b) to alveolar (n, t, d). This gives me words like man, pan, mad, bad, etc. Then I move to another movement pattern - often alveolar to bilabial (tap, dip). And so on. Speech FlipBook is clearly an amazing match for an intervention program like this - with this app, it is super duper easy to systematically select and maneuver through these target words during treatment sessions. Further, Speech FlipBook allows the user to hear the individual sounds in each word (d...i...p) and/or to hear the word blended together (dip); this can be a useful way for children with apraxia of speech to work toward blending the sounds together into a word. And, the user also has the option of recording his production of the word for playback. This is a fantastic way to provide a child with immediate and powerful feedback about his/her word production. There are only a couple real drawbacks to this app. The first is that it doesn't contain pictures, so, if you are using it to obtain independent productions from an individual, that individual needs to be a reader. This limits the use of this app with preschoolers. However, I still use the app to help myself generate words lists to be used with preschoolers - I just generate pictures off of those word lists to be used with the child. The second drawback is that this app is limited to words that are one syllable. While it is powerful tool for children with apraxia of speech, it is not the only tool an SLP needs to generate words for this population, as it does not include multi-syllabic words. In the end, though, Speech FlipBook is absolutely a wonderful tool to have in my SLP toolbox. It provides me with the means to make my therapy sessions more efficient for a variety of children on my caseload and is a fantastic addition to the apps on which I rely as a pediatric SLP. Advertising Disclaimer: Tactus Therapy provided me with a free version of Speech FlipBook to review. However, my opinions about the products I blog about are my own. Note: This post was orginally published on as a Guest Post by me on Joy's Autism Blog. I'm sharing it here again for my Child Talk readers! 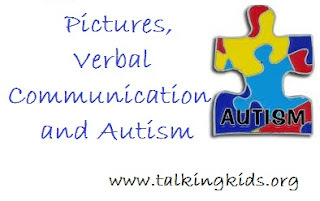 Over the past thirteen years of working as a pediatric speech-language therapist, I’ve found that pictures can be a highly effective tool for working with children who have a diagnosis of autism. Children with autism are often highly visual and concrete learners; pictures have a way of slowing language down and making it more concrete. I use pictures in a wide variety of ways, but today I want to share with you how I use pictures to facilitate multi-word phrases with children who are just learning to use language creatively. 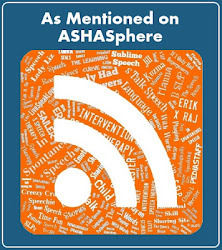 Most children with autism use echolalic speech. We think that this is because their brains process information as whole chunks—something we call being a gestalt learner. As a result, many of the children I work with have learned whole phrases that they use without actually understanding that each of the words in the phrase has individual meaning. For example, I’ll often see young children with autism say, “do you want to swing?” when they actually mean “I want to swing.” They do this because this is what they’ve heard asked of them when they were standing in front of a swing that they wanted to swing on. Not understanding that each word has specific individual meaning, they just repeat the whole phrase they heard in an attempt to communicate what they want. One of my strongest beliefs as a speech-language therapist is that we need to teach children with autism that they can create meaning through putting words into a wide variety of short sentences. This is the generative aspect of language that makes it so that we can all create sentences we have never heard before, and it’s an essential aspect of language development. Without it, children are left to memorize sentences for specific situations and this highly limits their language skills. When I work with children with autism, I make sure that they are using a wide variety of two-word phrases (see my list of early developing two word phrases here). Make a picture to represent “ball” as well as pictures to represent each of the colors. Place a Velcro strip on the front of a binder, and put Velcro on the back of all the pictures as well. Get out the ball and hammer toy and place it on the floor next to the pictures. Hold up the balls and allow the child to reach for one so I know which one he wants. Quick create the phrase on the Velcro strip that matches the ball he wants. Say, for example, he wants the green ball. I would put the picture for "green" and the picture for "ball" next to each other on the front of the binder, creating a small picture sentence ("green ball"). Point to each picture as I say the word in the phrase (“green ball”). Have the child imitate me. Give him the green ball. Repeat the process, exchanging the color word on the velcro strip to represent the color ball the child wants. As quickly as I can, I back off of prompting him to create the sentences and let him create the sentences on his own. And, as quickly as I can, I get rid of the pictures and let him just use his verbal words. The ball activity is just one of hundreds of activities where something like this would work. You might use this strategy to teach your child to create the phrase “eat + (food item)” or “watch + (movie)” or “play + (name of computer game)” or “go (location).” The key lies in finding an activity that allows you to teach your child that he need to mix and match words together to create his own sentences that have meaning to him. Once he understands the power of creative language, he’s well on his way to being an advanced communicator.